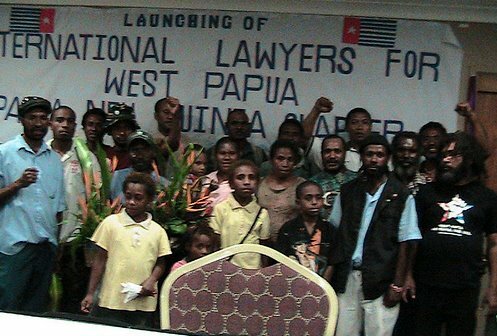 On 5th April 2009, the anniversary of the Day of Hope 1961, which commemorates the New Guinea Parliament in 1961, International Lawyers for West Papua (ILWP) was launched. 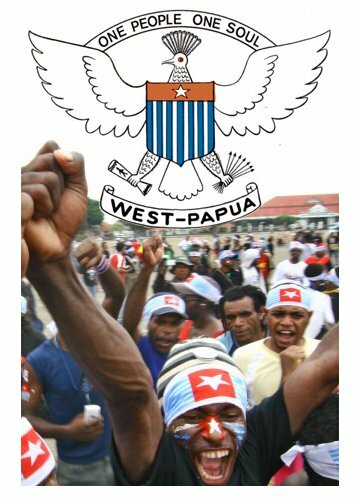 The ILWP’s mission is to help the indigenous peoples of West Papua to exercise their right to self-determination under international law. ILWP was launched in Guyana, South America. Also present at the launch was Colin Andrews, Chair of the National Toshaos Council and head of all indigenous peoples in Guyana. He pledged support for ILWP in it’s work to help bring about self-determination for the people of West Papua. Following the launch Benny Wenda was invited to visit Amerindian communities and share his experiences with them. Throughout his visit Amerindian leaders and their communities raised the Morning Star flag in solidarity with their indigenous brothers and sisters in West Papua and pledged their support for their struggle. We the undersigned recognise and confirm that the indigenous peoples of West Papua have a fundamental right to self-determination under international law. We are committed to assisting the indigenous peoples of West Papua to exercise freely and peacefully their right to self-determination. We are also committed to upholding, strengthening and preserving the fundamental rights and freedoms of the indigenous peoples of West Papua under international law. We call upon the international community of States and the United Nations to uphold the international rule of law. We request indigenous peoples across the world to help the indigenous Papuan peoples to exercise peacefully their human rights. 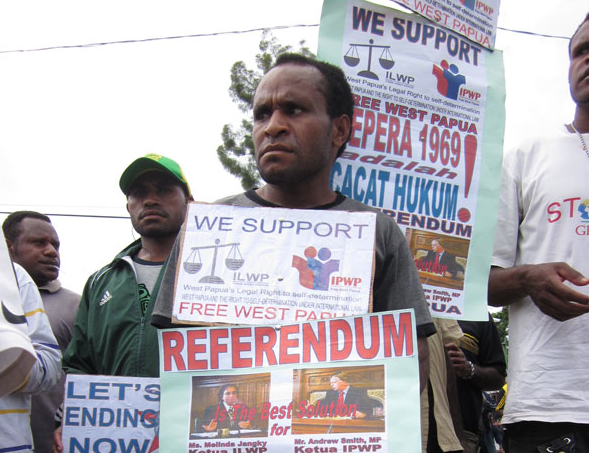 In West Papua, and throughout Indonesia, thousands of Papuans took to the streets to support the launch of ILWP . In the West Papua state capital of Jayapura, peaceful demonstrations were met with a violent response from the Indonesian security forces. Two West Papuans were killed, and dozens of others were arrested and tortured by the Indonesian police and military. 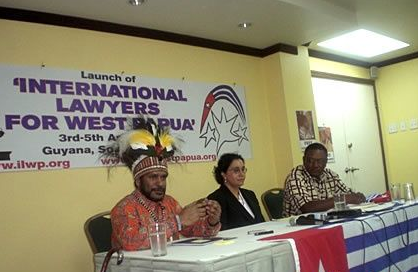 In February 2011, Benny travelled to the capital of Papua New Guinea for a launch event of ILWP. During his visit, Benny also helped coordinate the ongoing legal investigation being carried out into the Sunset Merona raids on West Papuan refugee settlements. These raids had seen hundreds of Papuan refugees forcibly resettled from their homes near the border of West Papua and Papua New Guinea. In October 2011, human rights lawyer and ILWP co-founder, Jennifer Robinson, hosted the UK launch of ILWP at the Finer Stephen’s Innocent Chambers in London. 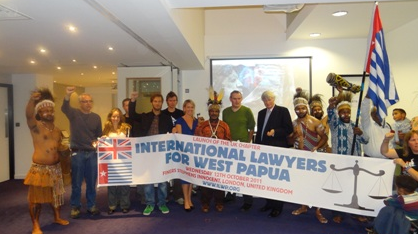 Speakers at the launch event included the highly respected QCs Jeffrey Robertson and Mark Stephens, who both outlined the legal right of the people of West Papua to self-determination. John Saltford, author of a book about the Act of Free Choice also spoke in detail about how the 1969 vote was flawed and was not a true act of self-determination. 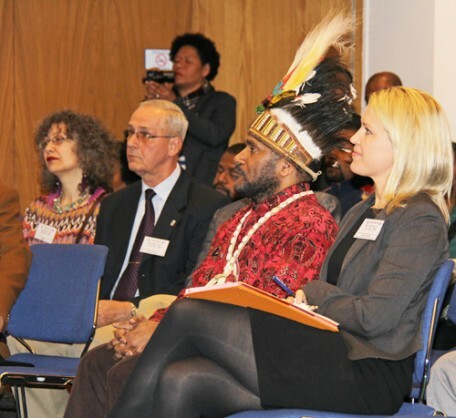 In April 2012, Benny and Jennifer Robinson launched the New Guinea Council at the Hague, Netherlands. The aim of the council is to examine pathways to the reinstatement of the New Guinea Council or Nieuw-Guinea Raad, the original Parliament of West Papua from 1961 until Indonesia’s invasion. Copyright 2015 - INFOPAPUA. All Rights Reserved.